Bosa Properties, in partnership with Kingswood Properties, have engaged international architecture firm, Büro Ole Scheeren, to design a new Vancouver landmark titled Fifteen Fifteen. Located at 1515 Alberni Street, the tower combines forward-thinking modern design with precision engineering and craftsmanship. Strategically sited between downtown Vancouver and Stanley Park, Fifteen Fifteen will occupy a prestigious location in Coal Harbour, Vancouver’s most desirable waterfront neighbourhood, and command a distinctive presence on the Vancouver skyline. 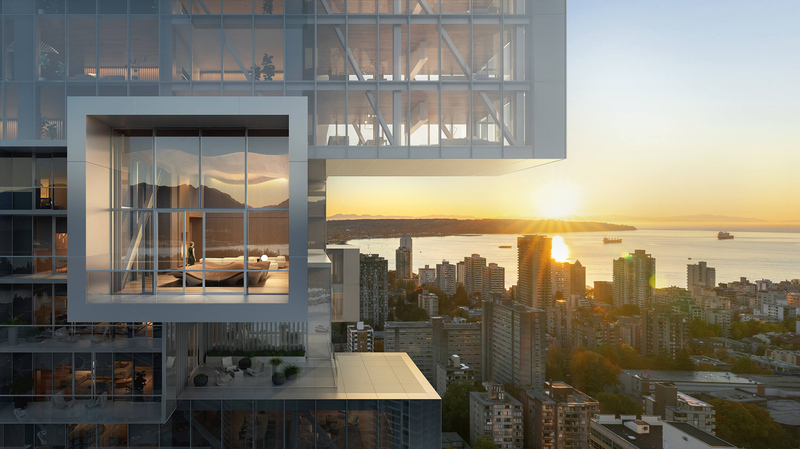 The 42-storey tower introduces horizontality to vertical living with dramatic glass-enclosed cantilevers, including a double-height residents’ lounge with a fireplace and private dining room, that extend towards the nearby harbour, mountains, and Stanley Park. Subtly elegant interiors emphasizing wood and other natural materials reinforce the connection between the residences and Vancouver’s pristine environment.